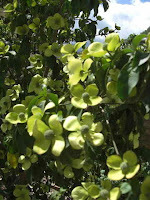 Chartreuse flowered dogwood trees with green seeds in the middle of the four petals, blue poppies in remote ranges, exotic orchids by the hundreds hiding out in thick pine and cypress forests hanging with moss, there is a world of horticulture that Bhutan citizens augment by their own interest in roses and potted flowers. We had been invited for a special cleansing from sins and evil spirits followed by a lengthy blessing for long life from this holy Buddha disciple. If it is a chance to learn more about world spiritual, I’ll give it a poke. Although I’ve gained much security in my own beliefs seeing other cul tures on this trip, I find there are many similarities in all religions, such as the use of holy water for cleansing (in our baptism, in Jewish rights, and in Buddhist and Hindu traditions.) Rivers such as the Ganges in India and the Jordan in Israel and streams that pop out of mountains without mouths take on curative powers, be it their water or their mud. Maybe we should re-think the Mississippi. 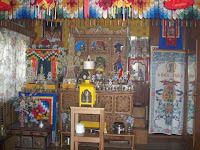 After entering the Lama’s home, and greetings all around, we were led into the well lit, well decorated puja room with one wall a well-stocked altar. At the other end in front of huge windows and a carpet of dragons, sat Lama in the lotus position (I admire people who can sit that way, I cannot so I have to be careful I don’t point my feet at him) )with long thin pages of Buddhist scripture written in Dzonkha opened before him. These words were to be used in the ceremony, a script to follow as we Episcopalians look to the Book of Common Prayer for ceremonial regularity. On his elaborately painted desk was a metal vase with a peacock feather fan. The peacock is a bird who can eat poison and survive, the Lama explained, therefore the feathers symbolize the peacock taking away all poison that might be damaging a person’s heart and soul and body. Beside it was a bronze bowl of dried rice, often tossed during the ceremony along with seeds from jacaranda pods, and a yak butter candle sculpture, which was slowly melting, having been lit. All was ready for us. We sat down on a thin mattress on the floor and I tried to cross my legs Yoga style, with no success. I asked the Lama how he can sit for hours with his legs flattened out in a cross u nderneath him and he said lamas and monks grow accustomed to that in childhood. I guess it’s like me sitting in a chair with my legs crossed. (Incidentally the future Buddha manifestation - yes, Buddhist believe Buddha will come again in another form recognizeable - sits Western style on a chair. Hmm.) There were two monks assisting and all three began to chant the Buddhist scriptures in a deep guttural hum. I sat beside the Lama on the floor since I was the principle character in this ceremony. My friend Sonam, an elegant Bhutan lady, instructed me on how to do things during the ceremony. 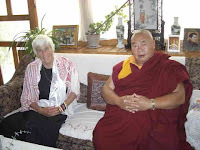 Then when we were asked to repeat after the Lama certain words from the scripture asking for blessings I tried to repeat him just listening to sound. I knew nothing about what it meant, but trusted it fit in with my omnipotent God’s spirit. W e frequently said "she she she" and that means "please please please." Holy water from a sacred fresh water stream in the mountains, mixed with saffron so it was yellow, was poured on my white hair and then in my hands - "drink this and then wipe your hair with what’s left," Sonam said - and this was done a number of times during the cleansing phase. At one point we sipped a home-made sweet herbal wine - blood red - from a skull bowl and ate a long life herbal ball, the size of a large peppercorn, made by the Queen Mother of Bhutan and shared only with monks and lamas. There was drum thumping, and bell ringing, and chanting for a long while. The karma was good, the Lama said. He smiled as we finally came to the end and katas (the white scarves) were received, blessed, and given back, along with yellow and red string blessings tied around our necks. After the ceremony was completed and I’m around for a few more decades - if it worked - we moved to his living room and were served Masala tea (with milk) and homemade cookies. The Lama, who is in the process of restoring his monastery about three hours away from Thimpu, was off to meet the young fifth King of Bhutan to request a few logs from the forest to be used in the restoration project. I was told later he received the permit and felt like this day was a very special one. Bhutan serves the chanting peace of the Buddhist mindset. 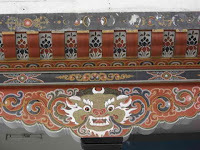 Even buildings are trimmed in painted wooden frames, many depicting the four most powerful spiritual beasts - the tiger, the snow lion (mythical), the fire-breathing dragon, and a strange looking bird, also mythical. What you paint on the outside is to prevent evil and the unwanted to have a rein on your daily life. On the one hand, every single building resembles a Swiss chalet with wooden cathedral-like windows, , but on the other hand, the community decor gives more identification to a precious way of life and culture. I’m still impressed that 90 per cent of the people on the streets in city or rural land - and even sweeping streets or tilling the soil with oxen - adhere to the national dress custom, men in plaid knee length skirts, belted, with the top half very blouse-y and perfect for a carry-all; women wrapped up in ankle-length skirts of bright handwoven stripes and embroidered patterns, topped with colorful silk blouses with long cuffs that fold back over a silk or satin jacket in a contrasting color. The varieties are endless. Most women have the short bob haircut of 1920s flappers. (Their hair is only black). This habit of dress begins early in their lives, so there is no desire to not wear it when they are adults. It’s required in all official functions and in jobs. Sonam confessed that men become fashion plates and many have over 50 "gho"in their wardrobe. Our young guide said he has seven. The patterns range from a solid color like gray or navy, to the finely plaid tartan prints. At one point, men wore argyle socks with the dress, but now the favor is long black knee length socks. 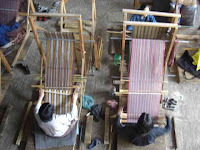 We visited an arts and crafts school, sort of like Job Core for young artists, where they can chose b etween woodworking or doll making or Thangka painting or embroidery or weaving, among other crafts, and serve out a four to six year apprenticeship. The next step would be to work decorating houses and wood or in one of the textile enterprises where women sit on the floor, barefoot, and weave fabrics for national dress. A simple pattern would take about two days. A complicated colored pattern with an embroidered effect, takes over a month on back strap looms, is much more expensive, and the weaver can earn one fourth of the selling price. The faster the weaver, the more fabric she can turn out, the better her pay. If nothing else, Bhutan never fails its faith. It is a country of prayer flags, stupas, chortens and Dzongs. Flags, new or faded, fly everywhere. Throughout the mountainous landscape you spot gro ups of tall poles of mostly white vertical prayer flags, 108 in a group, honoring the dead. Colorful prayer flags are draped at inopportune places (you wonder what fool crawled across open crevices and in giant trees to string them up) as well as at religious sites. 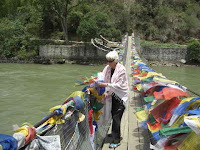 When we arrived at a the Amanakora Punakha hotel, we were presented with prayer flags which we were asked to hang on the suspension bridge, the only way to cross the river to reach the small r esort. As a gift there was a roll of prayer flags and incense on my pillow that night with this message: "Although there are only 700,000 Bhutanese millions of prayers and blessings are released into the world each day from the fluttering of the prayer flags each turning of prayer wheel and the silent mantras sent to the heavens on incense smoke. 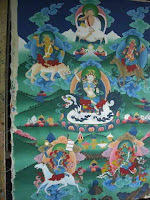 The horse at the center of your prayer flags is called the Lungta, the wind horse. It rides the winds of the world carrying blessings and protection to all those whom the wind touches." Long live horses and prayer. They’ve certainly been cornerstones for me. 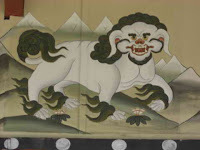 Photos: green dogwood flower; Lama Tulku blesses me; altar at Lama Tulku's home; a snow lion trim on a house; a Thangka by a group of students; women weaving fabrics for the national dress; hanging prayer flags on the Arman resort bridge; A brilliant snow lion, a sacred mythological animal.